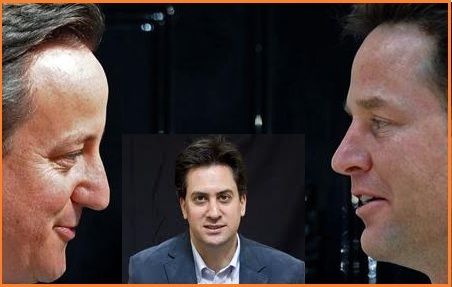 Cameron – The years of Big Society? You cannot just speak with a passion, but without sense or proportion. You need intellectual basis to your arguments in order to win the electorate to them through slogans and ideas wire tapped into that intellectual base. Also has too much pain been loaded into the early years of this parliament purely out of the National Interest? To get it wrong, inflict pain on voters and suffer worse economic performance than our competitors and come under attack for wasting money through rushed reform could spell electoral defeat, the same reform achieved together with with electoral success with a more conservative approach to it. David Cameron: donâ€™t take popularity for granted, there is work to be done connecting Cameron ideology with the electorate, and that may mean pacing reform a bit more cautiously. 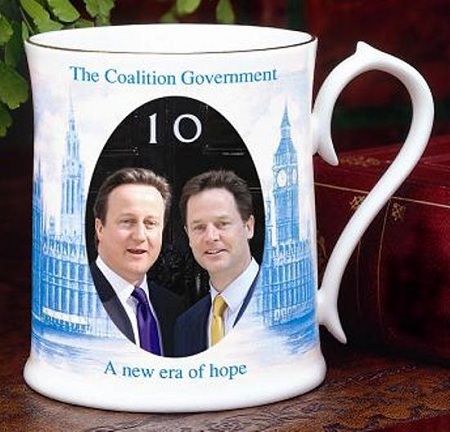 What rescues the LibDems is they came into coalition in the â€œNational Interestâ€ to sort out the economic mess left by Labour? Clearly some LibDem voters not convinced they are actually having a positive influence across government policy – if privately LibDem MPs feel cutting to smaller state inconsistent with social liberalism cornerstone to their own political beliefs and values they are going to need to be good salesman. Nick Clegg: a tricky year ahead â€“ since early 1980s a social liberal policy platform opposing what David Steel called â€œapartheid of the pocketâ€ more recently opposition to tuition fees, was focal to your electoral base, danger is you may become identified as unprincipled career politicians who did not do enough to defend social liberalism important to your party. In other countries a mayor or governor comes in with CV evidence theyâ€™re competent and to be trusted â€“ what can British oppositions do between elections to demonstrate competence and strength of ideas? Only real way of assessing opposition leaders has to be how competitive they are in elections. Benchmarked against 1980s and earlier, Labour leader today owns his partyâ€™s policies. His activists canâ€™t be bothered to shape policy, they leave that to â€œthe expertsâ€ – delegates turn up and applaud mouthing â€œheâ€™s my leader and I support him.â€ DavidM was right, from EdMâ€™s first hours he was somersaulting over â€œdoorstep difficultâ€ policy positions, most of those who supported the policies of government now smile and clap each u turn. Despite the branding by the Tory media, I donâ€™t see this crop of Labour leaders ideologically driven (compared to the likes of Benn, Foot, Crosland). In fact, on what EdM and Balls already say on immigration, Europe, cuts, tax, jobs etc they are hungry to be popular on doorsteps and win elections. Ed Milliband: people giggle at your â€œsqueezed middleâ€ though its clear to me you know what you are doing and have no scruples doing it. The coming years will surely bring you electoral success. If things have been going to plan then thousands of electors in Oldham East and Saddleworth will be receiving their by-election voting packs in this morning’s mail. We haven’t got a figure yet on the number of postal votes but at the general election it was 8,316 out of 45,092 votes. Given an expected smaller turnout and the efforts that the red and yellows have been making getting supporters signed up my guess is that the postal proportion should be substantially larger. The experience of other elections is that postal voters don’t hang about – many vote straight away. For them the by-election is over even though the campaign continues for another thirteen days. The Survation poll that is being carried out is expected to be published early next week and does include a question on postal voting. Hopefully the firm will provide a party split which could provide an interesting pointer. Tory activists have been contacting me to say that they have been asked to go to Oldham and it’s clear that a late attempt is bring made to get the blues back into the game. What will be critical is whether the polling shows that the blues are in a better position to beat Labour than their coalition partners, the Lib Dems. The experience of previous by-election battles is that the party perceived to be third place gets squeezed in the final days. This is turning out to be the most absorbing by-election for several decades. I’ll refrain from making any firm predictions until we get some polling but on the basis of current national polling Labour should win. But a good omen for the yellows? : the last time Labour lost a seat in a by-election while in opposition was at Greenwich in February 1987 – a battle that took place shortly after the England cricket team last retained the Ashes in Australia. The victor there was the Liberal-SDP alliance. Who will you nominate for the site’s annual award? Every year since the site began we have run an election for the “Poster of the Year” when lurkers and commenters can decide who has added most to our discussions over the past twelve months. The process is in three stages. At this stage we are seeking nominations. Who do you think should we should be including on the list of possibles? Can you use the thread below to make your suggestions with the name of the person at the top of the comment and your reasons. The one rule is that previous winners, in 2009 it was Richard Nabavi, are not eligible. Rod Crosby for consistently in the years leading to May 6th 2010 arguing here that just about the only possibly outcome was a hung parliament. Antifrank for his consistent analysis and insights. Yellow Submarine who throughout the year has brought his perspective to PB during a period when his party has become centre stage. From those names you suggest a long list will be drawn up for you to vote on. In the first round you will be able to vote for as many of the names on the list as you like. Then there will be voting on the top five on a FPTP basis to choose the winner. So there is no doubt I make the rules and will intervene at my absolute discretion on any matter. I am on holiday in Scotland for the New Year and the structure this year has been designed to minimise my input. Are the Tories set for a “centenarians’ voting boost”? Does an ageing electorate add to the challenge for the reds? 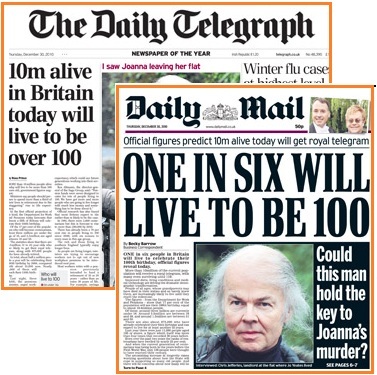 One of the stories carried by several papers this morning is the projection by the Department for Work and Pensions that almost a fifth of Britons will live to 100. This is all based on population trends that point to about half a million people a year celebrating their 100th birthday by 2066, compared with about 10,000 now. But this is not just a long-term development. The figures suggest that more than 2 million currently aged 51 and over can expect to reach the 100 threshold. This clearly has massive implications for large parts of the public services which can expect demand on them to increase. But here at PB our focus is on the impact on voting and future elections. On the face of it this could present Labour with massive future challenges although because of their voting power all parties have to be concerned about the oldies. Is it any wonder that in the Osborne cuts package in October the so-called pensioner perks – winter fuel allowance, free bus travel, prescriptions and TV licences – were untouched even for the very rich? Coming up later on PB: The first stage of the election of the Politicalbetting Poster of the Year. Will the automated phone survey change the betting? 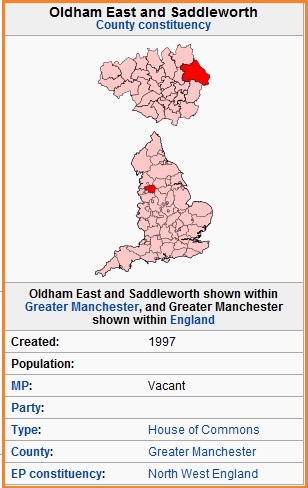 I’ve just had word that the automated phone pollster, Survation, is carrying out a survey in Oldham East & Saddleworth ahead of the by-election. The firm carries out surveys, like a number of US pollsters, by automated phone calls. Respondees answer by keying in their answers on the key-pad of their phones. ComRes used something similar for its post-debate general election polling when it was trying to produce an almost instant response. Rasmussen used a similar approach for the Indy ahead of the 2001 election and came out with a pretty good result. Survation tell me that as well as the standard VI question there are questions on past vote at the general election, how certain those questioned are about turning out and whether they have applied for postal votes. The latter could be very significant because both the reds and yellows have been working like crazy for weeks building up their postal vote bases. Those interviewed are being prompted by both party and the candidate name – which seems sensible in a by-election where so much emphasis is placed on the candidates themselves. Survation is not a member of the British Polling Council and I had heard little of it until now. According to its website it carried out polling during the Labour leadership race and I am told it also did a general election exit poll. I don’t know where or when the Old & Sad poll will be published but it’s findings could play a key part in establishing whether the blues or yellows are best placed to challenge Labour. At the general election it was LAB 31.9%: LD 31.6%: CON 26.4%. 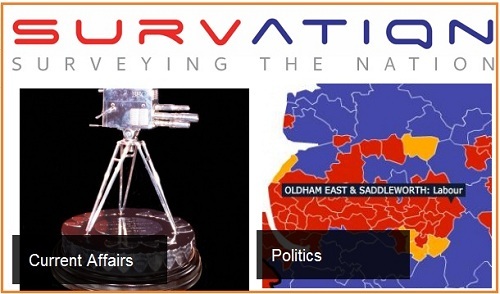 UPDATE: Survation tell me that they are applying to join the British Polling Council. 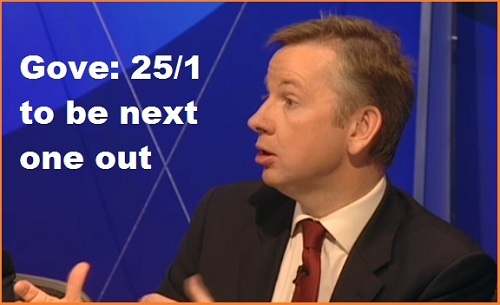 Is Michael Gove the value bet as “Next To Leave”? How many mistakes is one too many? Michael Gove appears to have performed so many U-turns this month that perhaps he should have been the cabinet member on Strictly Come Dancing. Heâ€™s certainly required fancy political footwork to come out of the episode without too much damage, having firstly changed his mind on the funding of school sports and then again on provision of free books. This comes on top of embarrassments during the summer when his department released inaccurate lists relating to the revised BSF programme. He took quite a hit for that, despite it being mainly the fault of the officials who put the lists together. Strangely, the damage heâ€™s taken this time hasnâ€™t been as bad even though the policy decisions were much more his responsibility. Heâ€™s lucky that higher education no longer falls within his departmentâ€™s brief otherwise heâ€™d have had tuition fees too. Even so, heâ€™s been an accident-prone member of cabinet so far which has to beg the question as to whether the 25/1 Ladbrokesare offering for him to be the next cabinet minister to leave represents attractive odds. Both the U-turns have several things in common: the consequences of the original decision were not thought through, the likely resistance of high-profile lobbyists was missed, the proposed cuts were for relatively small amounts and apparently in neither case did Gove consult about the proposals. This seems to be Goveâ€™s way. He is driving through a substantial and radical programme and itâ€™s true that one time-honoured way to prevent its implementation is to bog it down in reviews, consultations and so on – things heâ€™s obviously determined to avoid. That said, a failure to consult even with those who should be on his side, combined with a repeated inability to spot a political landmine is a weakness and one that could potentially prove fatal. Given that the projects in question were concerning small amounts relative to the overall budget, it does beg the question as to who put them forward and why. Gove has taken on a lot of vested interests within the education establishment. Heâ€™s not tried to win it over to his way of thinking, presumably either because he thinks thereâ€™s no way he could or because he canâ€™t be bothered. There will without question be many who wish to stop him and the U-turns this month will no doubt serve to strengthen their resolve, especially as Gove retreated both times he was challenged. The Next to Leave market is essentially about resignations before a planned reshuffle, and resignations tend to come because of policy disagreements, personal problems or serious political errors. Of those three, thereâ€™s almost no reason to see him leaving because of a policy disagreement, personal issues are usually nigh-on impossible to predict but he does look vulnerable on the final possibility. His odds imply heâ€™s one of the less likely to be next out. I donâ€™t think thatâ€™s making sufficient allowance for events and in particular, the potential to seriously mess something up in a big department carrying out radical reforms while his political antennae are malfunctioning. How many 2011 predictions will John Rentoul get right? What do we think of the Blair biographer’s predictions? The Indy on Sunday’s political editor and Blair biographer, John Rentoul, has published a list of his main predictions for 2011 and they are set out in the table above. While I do think that Labour’s got a good chance in Old & Sad I think he’s stretching it a bit to describe such an outcome as a “Labour gain”. The notional 2005 result for the seat had Labour with a 10.4% lead and in May, of course, Phil Woolas won. Labour is the incumbent and of it was a lesser commentator than Rentoul writing this he could be accused of trying to spin the result before it’s happened. Then there’s his forecast for the AV referendum. Rather than go for “Yes” or “No” Rentoul suggests that this will be a “Lib Dem loss”. Certainly it would be a blow to the yellows but the only party the party that had this in its manifesto at the general election was Labour. As to the outcome that’s a pretty hard call. YouGov polling suggests that the no camp are winning by a margin while ICM have it the other way. Everything depends on the campaign and here those Labour heavyweights from yesteryear lining up in the NO camp – Beckett/Prescott/Blunkett/Reid could make a big difference – though I can’t work out which way. Whatever this is the time of year for predictions and in the next few days Double Carpet will be reporting on the outcome of the PB 2010 prediction contest as well as the question for the next twelve months. With the postal vote packs in the Oldham East and Saddleworth by-election due to be mailed out in the next couple of days the latest by-election betting shows a weakening of the Tory price across the board. SkyBet has the best traditional bookie price of 25/1 while you get get 30/1 or better on the Betfair exchange. The bookies tell me that there’s hardly any interest in the blues at all – all the focus has been on Labour and the Lib Dems whose candidate, Elwyn Watkins, was the one who created the contest following his successful legal action over Labour’s general election campaign. On the face of it this should be an easy Labour victory and perhaps the party’s biggest challenge is ensuring their supporters are not so over-confident that they don’t see the point of getting out to vote. What we haven’t got is any polling data or other hard information to guide us. The timing of the campaign over the Christmas and New Year holiday periods has made it difficult for pollsters though we might get something once the new year holiday is over. The main impact of a poll could be if it showed the Tories doing better than the current betting suggests.